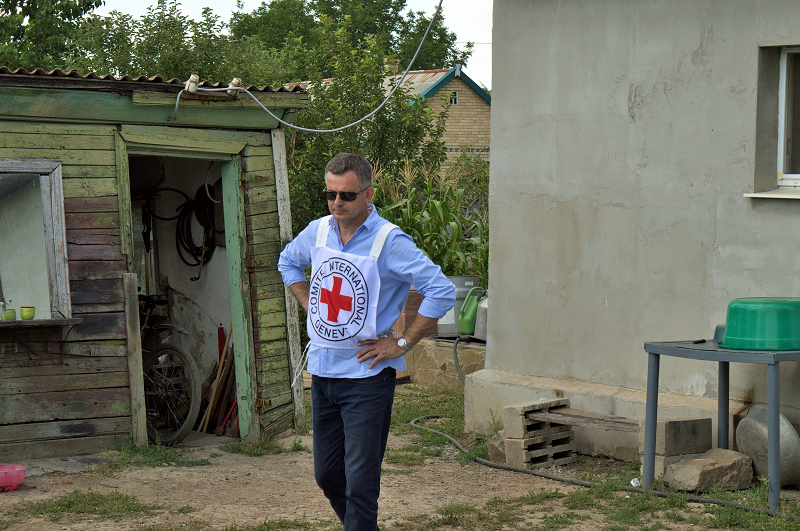 Nebojša Munjes has been working with the International Committee of the Red Cross (ICRC) for 18 years. He started as a driver in Serbia, and then went on missions in Sudan, Pakistan, Israel, and South Sudan. 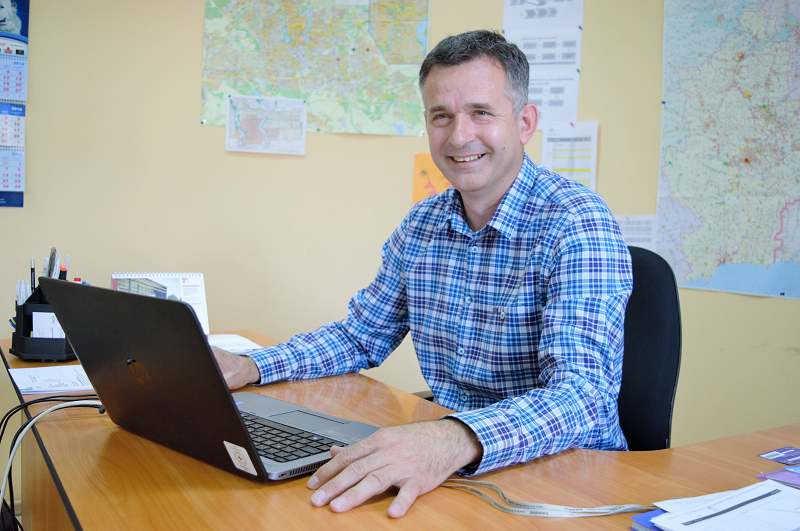 Since 2016, he has been in charge of the ICRC Logistics Department in Donetsk. Nebojša, tell us about yourself. How did your life change because of the conflict in your country? I am a Serb born and raised in Croatia. I dreamt of becoming a doctor, but in 1991, while in the third year at the Medical University, I had to quit my studies and leave my hometown because of the crisis in what was then still Yugoslavia. I took my younger brother with me, who was 17 years old at that time, and we went to Belgrade. For one year, we lived in a student dormitory where I worked as a receptionist and, as remuneration, I received free accommodation and food. My brother finished school in Belgrade, while I could not even think of continuing my studies. Instead, I would take up any job to make the ends meet. At that time, the ICRC was distributing food parcels and hygiene kits to refugees in Belgrade. I was shy to ask for aid as I considered myself young and healthy, while there were many vulnerable people who needed it more than me. For quite long, the crossing points between Serbia and Croatia remained closed so we had no opportunity to return home and see our parents and sister. We could only call them, thanks to the ICRC which provided a satellite phone connection to everyone who wished to stay in touch with their relatives. How did you start working with the ICRC? I always felt the need to help people, both at work and in everyday life. I feel happy when I am useful. I entered the university to become a doctor in order to be able to help people. I can say that the ICRC gave me a second chance to realize this wish. I joined in 2000 as a driver, and I worked in different roles in logistics for more than seven years. Then I became a delegate and went abroad. 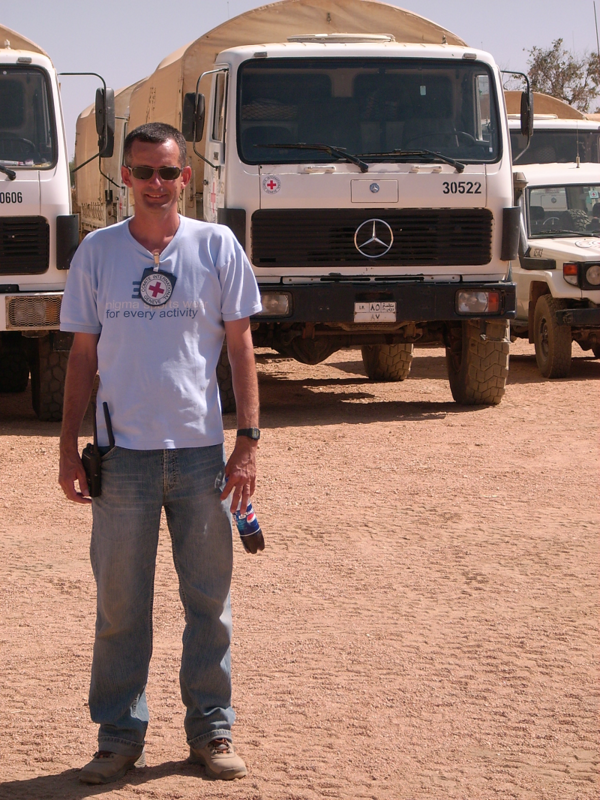 In 2008-2009, in Darfur, Sudan, I organized humanitarian assistance convoys, each comprising of 15 to 30 trucks. I was responsible for safety of the colleagues, and aid delivery. In my next mission, I accompanied humanitarian convoys in Peshawar, Pakistan. From 2010-2014, I was a truck driver in Jerusalem. In parallel, I began studying logistics. In my next mission in South Sudan, I was the head of logistics where I gained experience working with different supply routes, including by land, air and water. Now I am in Donetsk. Can you share a memorable experience from your work? In Sudan, delivering humanitarian assistance is a really impressive process. Rainy seasons there lasts from May to November, and non-asphalted roads are turned into rivers. It is only possible to deliver assistance by air. There are not many proper airstrips for the plane to land, so it would hang over somewhere close to a settlement and drop food bags. Our colleagues then collect the bags and prepare them for distribution. Construction materials and medicine are also transported by air. In addition, logistics are challenged with only a few makeshift airstrips available, which are often flooded. Another memorable experience comes from South Sudan in 2016, when my colleagues printed a photo album, with information about the missing people and their photos. It was a really important project as most of the local residents did not have other means through which they could learn the news about their missing relatives, such as phones, radio or TV. We brought the album to one of the communities and showed it first to our focal point of the national Red Cross. All of a sudden, he broke into tears as on one of the photos he recognized his brother who had disappeared five years earlier. I was sitting next to him while he kept looking at the photo not believing his eyes, and crying. It turned out that his brother was in a refugee camp in Ethiopia. The ICRC helped him establish contact with his brother. How is the logistics work organized in Donetsk? The challenge here is that good weather doesn’t last long. This means that the main work, such as delivering construction materials and repairing damaged houses, schools or hospitals, should be arranged during the warm season. We also deal with seasonal delivery of humanitarian cargoes, such as coal for people to heat their houses in winter, or greenhouses, chicken and fodder in summertime. We work closely with other colleagues in the office to address the needs of different teams. It is possible to plan the logistics properly as well as predict possible risks associated with scheduling and delivery when you understand what is actually required or what particular type of materials should be donated. How often do you visit your home and see your family? I have a 17-year old daughter and two sons, 12 and 7 years old. I visit my family in Belgrade regularly, but it is never enough. In Jerusalem, they were with me and I really enjoyed it. I would love to take my wife and children with me again and, I am sure, they would be happy to be together again. You often work in countries affected by conflicts. How does your family feel about that? My family, especially my wife, supports me in my decisions. Of course, they are concerned every time I go to unsafe places. My youngest son is very proud of me and he tells his friends at school about my work. He is always interested in what we do, how and what kind of relief we deliver. He told me he understands how much my work helps people who suffered as a result of armed conflict. How do you spend your free time in Donetsk? I like to be active. I am fond of sports, so I play football and tennis with my colleagues, and I ride a bicycle. I am also learning Russian and sometimes go to the drama theater. 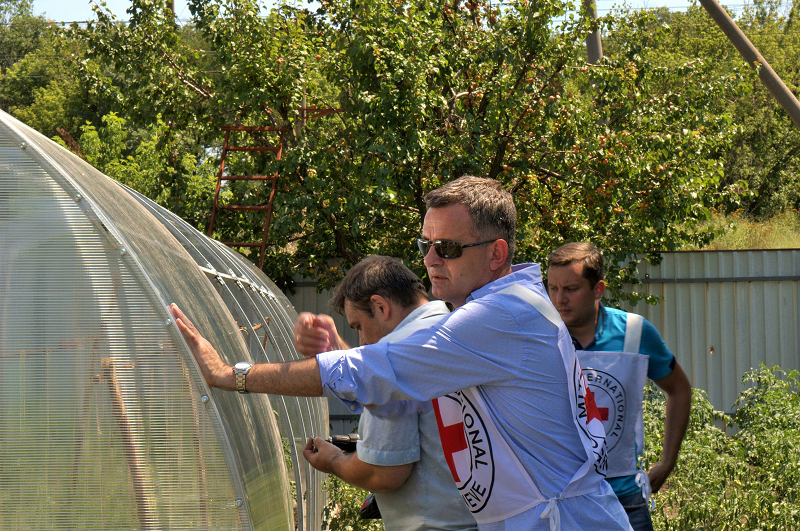 What does working for the ICRC mean for you? You know, I don’t get tired at work. Helping people is my second nature. I always try to make things go smoothly and without delays. I am particularly amazed by the ICRC’s fundamental principle of impartiality, where the focus is on people, making no discrimination as per nationality, race, religion or political views. The ICRC does not take sides in any conflict, which allows us to work along the lines of contact and support those are in need. I am happy to be part of this important work.